Back to Cornell for today’s Top 200 Photo. 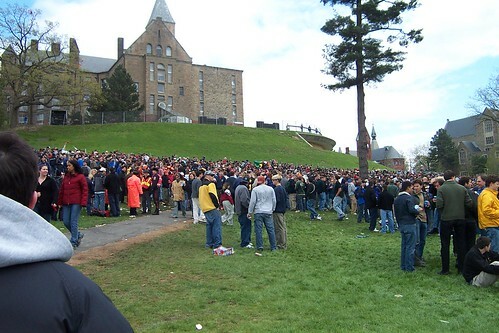 Slope Day is an annual day of debauchery at Cornell, taking place on the last day of classes. Slope Day has gone through quite a few evolutions. This photo was taken in 2002, my freshman year, which was the last year in which Slope Day was a free-for-all day of drinking. I’m not sure why Cornell went back to a structured festival the following year (as it apparently had done way back in the day), but I think it probably had to do with the emergence of digital cameras and nascent social networking sites that were giving the University a bad reputation. Additionally, a few Ithaca High School kids died of alcohol poisoning. While I feel this wasn’t Cornell’s responsibility since Slope Day was not an official school function, apparently they felt differently. I had mixed feelings about what it evolved to. On the one hand, they started inviting bands to come perform and they had carnival games and food. On the other hand, in order to keep non-College students from getting any alcohol, they fenced off the area which made it really annoying for those of us who had to get to class or lab on that day.